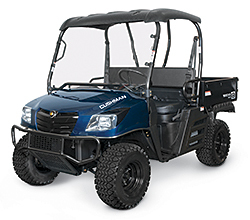 The 1600XD combines four-wheel-drive capability with a 22 hp, 1,007cc three-cylinder OHV diesel engine to handle large tasks on tough terrain. Its performance is further enhanced by: an automatic, continuously variable transmission with low- and high-gear ratios; a user-selectable locking rear differential that can be engaged in both two-wheel- and four-wheel-drive operation; four-wheel independent suspension; and exceptional hauling and towing capacity, with a maximum load of 1,600 pounds. It also features: a tubular steel rollover-protection system; three-point seat belts to protect the operator and passengers; and headlights with high-beam functionality to provide maximum visibility.